Here’s the Moon like you’ve never seen it before: a dramatic sunrise view of Tycho Crater on the Moon, highlighting the peaks and crags of the crater’s central uplifts. On June 10,2011 the Lunar Reconnaissance Orbiter slewed 65° to the west, allowing the Narrow Angle Camera to capture a “sideways” look at Tycho crater, resulting in a spectacular image. The central peak complex is about 15 km wide southeast to northwest (left to right in this view). Below are more images and a video which spans and zooms in to the entire image. 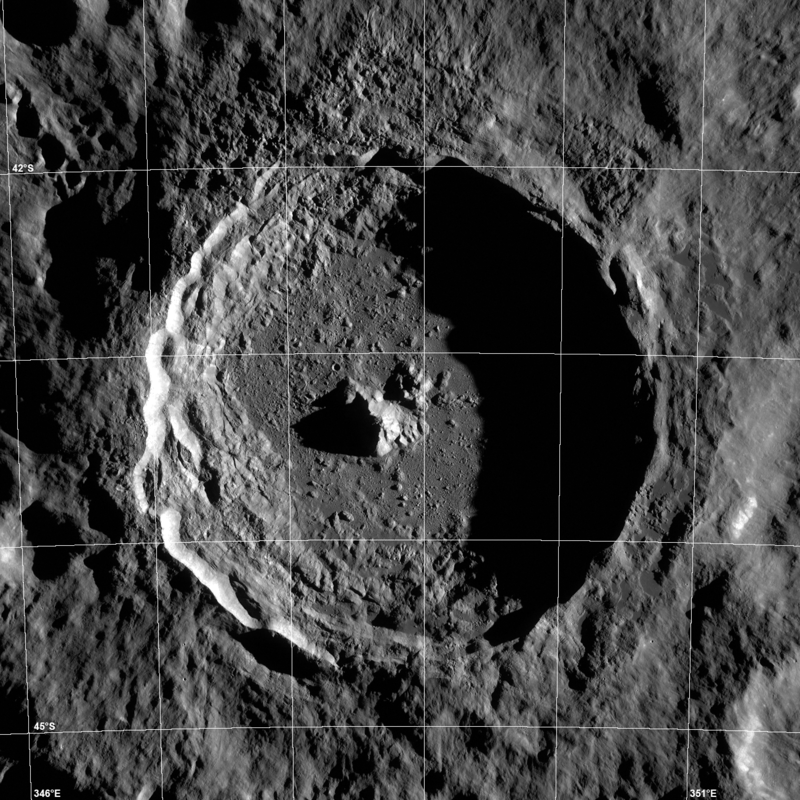 Tycho Crater is a very popular target with amateur astronomers since it is easily seen from Earth. The crater measures about 82 km (51 miles) in diameter, and the summit of the central peak is 2 km (6562 ft) above the crater floor, and the crater floor is about 4700 m (15,420 ft) below the rim. Central uplifts form in larger impact craters in response to the impact event. Here’s a close-up of the summit. The boulder in the background is 120 meters wide, and the image is about 1200 meters wide. LROC WAC mosaic of Tycho crater with lighting similar to that when the NAC oblique image was taken. Mosaic is 130 km wide, north is up. Credit: NASA/GSFC/Arizona State University. Click on the images for larger versions on the LROC website, or see this link for more information on these images.